Was it your choice to "forgot" the clock (at the right of the landing gear lever)? There is no vc link in the downloads page..? James142 wrote: There is no vc link in the downloads page..? In the fs9 section of the A380 download, the VC (or virtual cockpit) is included in the pack, that the links refers to, and the model is the model with a VC.If you're wanting an FSX VC, there is not yet a VC for the A380. Hope that answers your question James142. First of all, Congrats to the development team! Great work! The VC looks amazing! I just can't wait till the FSX version will be realeased. But for now i try to get the VC of FS9 into my FSX. But how can i do that. At this moment the VC won't work, and i think that's because of the different models of FS9 and FSX. How does people get the VC working in FSX? Stefan, just install the FS9 model in FSX. Open model.cfg and set normal to the FS9 model file. Delete the interior model line. The FS9 model contains both the exterior and VC in it, unlike the FSX one. Okay, but i don´t know how to change the model file? can you explain me something more about it? Sometime freeware has to comprise, not with PAIRBUS! After a long time ive got a new rig...Since i havent been to this forum in a very long time, I tried installing VC into the A380 FSX...but i got many bugs...i cant move the throttle etc...Just wondering was this problem fixed or does it still occur? How and where do I download the virtual cockpit? So far I have found no link and file for it. Do I just edit aircraft.cfg, or is there really a file for it? When is the VC for FSX to be released? Any preview of the A380 VC for FSX soon? ... Or is the project put on ice? When did we ever say it'll be released for FSX? A big disappointment if this won't be released for FSX... Why should it just be for FS9? According to other developers, you can do so much more with FSX. We were planning on updating the A380 for FSX, but that's fallen by the wayside---'cos of lack of interest. Although an argument between users and developers (PA) wouldn't help them developing it for FSX, I reckon we should just wait until PA has absolutely nothing to be getting on with but til then we can wait. Anyway, there was one thing I was going to ask, if it is developed by FSX, does it mean that the interior and exterior model are separate? That also means other planes can use your VC? Good thing or bad thing? I'm nobody to comment on it but certainly as a FSX user I would want it but it's not up to me to decide. 'Users' are always welcome to volunteer. Yes, they'd be separate, and yes, that's what it means. Yes, The A330/A340 X is probably their biggest thought now. That's okay, because that's more common aircrafts, and damn they look great Will they be released for FS9 of X? "Lack of interest" Yes this is exactly the worst thing about a developer, I'm not complaining, I can understand it. However it is rather sad to see a lot of projects simply disappear, because the developer has no further interest in it. Let me give an example, that made me really sad in the last two years. I was talking to David from IRIS Sim in early 2011, he sent me a video of their soon to be Eurofighter and i was the happiest man alive. It was said to be their next release, but later that year other projects were released and on question what happened to the Eurofighter, no answer was given. I still hope it will come, but my hopes are little and it is a huge disappointment for me. There is a positive example of "Lack of interest", which is brought by the same company. IRIS stopped development of their FS9 projects somewhat around 2008, I'm sure I'm a bit off with that, fact being they stopped to develop for FS9 and then started releasing their FS9 projects for free for others to adapt to FSX. That was one of the best choices they made, I have been a fan of their stuff and this catapulted them almost to my personal list of best developers. Now this is of course hard to compare to a freeware project like Pairbus, however since you guys started here, you came a long way and a lot of people hold a lot of faith in you. I can understand, that FSX seems to be given less love than FS9 for a number of reasons. Point being, there is however also a number of reasons to develop for FSX and use it's functions. I'm fine with your approach of putting and FSX update fairly low on your priority list, but I am not fine with putting it so far down the list, that in the end you will never do it. That, for me, is not acceptable and should not happen. You haven proven to be as good as most payware developers, so don't make their mistakes of letting a huge amount of people down. Be better than most payware developers and listen to your Userbase and do the projects people want to see, in your order of course, but at least, at some point, actually do them. For the sake of the Users supporting you and the sake of those who feel left down by payware developers. P.S: If it helps to any point, id like to empty my paypal account all over you to push this project up the priority list. Well just to sum it up in a few words, we're not financially or fan driven, we're more passionately driven which is independent of everything except ourselves. 2012 Juli: WHEN IS SOOOOON???? We never said that it would be released for FSX. They never said it was going to be for FSX. Besides, FS9 is much better than FSX. A320ER wrote: Besides, FS9 is much better than FSX. Well, thanks for that. This place has been lacking in inane arguments. esg wrote: Well, thanks for that. This place has been lacking in inane arguments. Lol yeah, bring it on ! I am sorry guys but from what I have experienced in FSX over the past couple of days in multiplayer is just amazing. Yeah FSX is not the best running game with addons. But it is better in my opinion. Anyways, it was said that a FSX version would be released soon, and it has been almost a year now? That is just sad to see other guys saying that it was never said that a FSX version would be made, WHEN IT WAS SAID. *EDIT* As posted above here is a picture clearly showing that it was said at one time in the official release! It's been said time and again: we're not here to serve you; this is a freeware project, and contributions have always been welcome. Amazes me how low people will go to try to prove their point. I Photoshopped that picture just for fun! 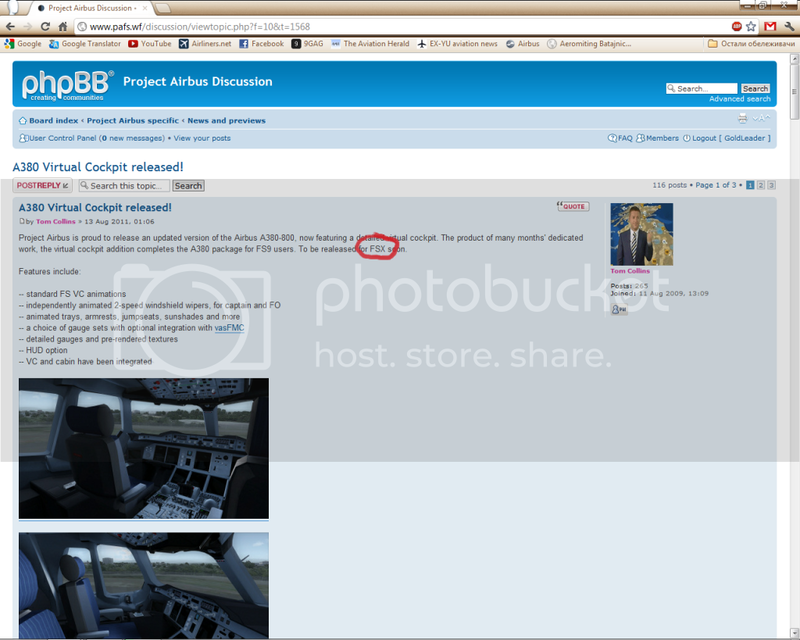 No, Project Airbus never said it will be released for FSX. It was a joke. Just a joke. Still PA is one of the best freeware developers, I'm not saying anything. Just keep on doing what you are doing! Although yeah, I'm a bit sad this won't get released for FSX, but still, as esg said you're not here to serve us, you're a freeware developer group. Glad that's been sorted out. Now can this topic rest in peace? PA team, i hope You guys update a380 vc for FSX.. Because i have alot of bugs in FSX..
P.S. Sorry for this question. Airbus Fan wrote: Because i have alot of bugs in FSX.. I hope you are just talking about the cockpit...FSX itself is one massive bug! We've no plans to update the VC for FSX. To be honest, I'm waiting for a payware A380 -2D (panel) that I can merge with PA's A380 in Fs9, but unfortunately there is no A380 panel insight. There is no news from NLS for ages. The VAS-FMC is only a makeshift, however a nice feature offered from PA. The real A380 has such great panel-features, and this system-depth is really missing in FS! Unfortunately gauge and panel programming seems to be still the domain of payware groups, though I'm enjoying the awesome PA outside model and virtual cockpit.